McCain confirmed Tuesday he’s planning to run for a fifth Senate term in 2010. "She did a great job of energizing our base. I'm very proud of her,” he said at a press conference in Phoenix, his first since losing to Barack Obama three weeks ago. “It's one of the great pleasures I've had to get to know her and her family, and I think she has a very bright future in a leadership position in the Republican Party. "....I knew that she would be an energizing factor, because she energized me," he added. "Our base, and most Americans, viewed Governor Palin as a breath of fresh air." Taking a look back at the presidential contest, he said his campaign was dealt a fatal blow when public focus shifted from foreign policy to the faltering economy. “The American people - and I respect that decision, I don’t in any way criticize it – [decided] that the economy was of vital importance. And it is,” he said. 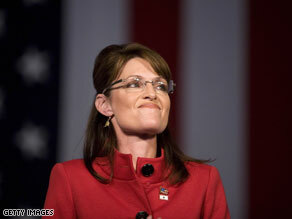 Cafferty: GOP’s chances if Palin is 2012 presidential nominee? Join the conversation on Jack's blog. It may feel like a long ways away, but Republicans are already looking ahead to the 2012 presidential election. According to a new Gallup Poll, Republicans and Republican-leaning Independents most would like to see Sarah Palin run for president in 2012. That’s right…Sarah “I read all the newspapers,” Palin. Former mayor of Wasilla, first-term governor of Alaska and hockey mom. Her interviews with Katie Couric are the stuff of legend. After she and McCain got their clocks cleaned, Governor Palin couldn’t get enough of the TV cameras. They were in her kitchen, her office, virtually every corner of her life. She is now reportedly being wooed to write a book-that would be interesting-or maybe do a TV show. Alaska Gov. Sarah Palin is slated to campaign next week for Georgia Sen. Saxby Chambliss. WASHINGTON (CNN) - Republican vice presidential nominee Sarah Palin will make multiple campaign appearances on behalf of Sen. Saxby Chambliss next week in Georgia, serving as the political closer for the GOP senator who is battling to win a second term. This is Palin’s first campaign appearance on behalf of another Republican candidate since losing her bid to become the nation’s first woman to serve as vice president. Palin will attend a fundraiser on Sunday night, then appear at multiple campaign stops on Monday in an effort to rally the GOP base to turn out to vote for Chambliss. The incumbent Republican is facing a strong challenge from Democrat Jim Martin. A runoff is scheduled for next Tuesday, after neither candidate received the 50 percent plus one vote needed to win on Election Day. Obama tapped Orszag to lead OMB with Nabors as his deputy. CHICAGO, Illinois (CNN) - President-elect Barack Obama pledged Tuesday to go through the federal budget "page by page, line by line" to eliminate excessive spending and get the economy back on track. "If we are going to make the investments we need, we also have to be willing to shed the spending that we don't need," Obama said at a news conference in Chicago, Illinois. "In these challenging times, when we're facing both rising deficits and a sinking economy, budget reform is not an option. It's a necessity," he said. Obama said that he has selected Peter Orszag as his nominee for director of the Office of Management and Budget. Orszag, the head of the Congressional Budget Office, is an expert on health care, pensions and Social Security policy. He worked at the Clinton White House as special assistant to the president at the National Economic Council and served on the Council of Economic Advisers. 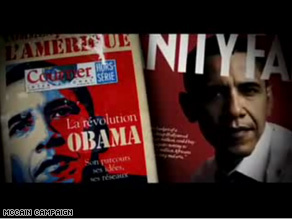 McCain's campaign released ads over the summer that painted Obama as an out-of-touch celebrity. WASHINGTON (Time) - What if the McCain campaign had run ads using footage of Barack Obama dancing with Ellen DeGeneres to show his coziness with celebrity? Or followed up on its Paris Hilton ad with others featuring Donald Trump and Jessica Simpson? All of that was on the drawing board of Fred Davis III, the advertising whiz that John McCain's used for almost all of his campaign media, and one of the most talented conservative political operatives in America. Oh yes, he also had an internet ad up his sleeve that would attack Obama's celebrity by associating him with Oprah. But in the end, he scotched that one. "We decided you don't really fight Santa Claus or Oprah, so we removed her." In an extended interview with TIME, Davis detailed what-might-have-been in the campaign ad war — and what self-censorship the McCain staff imposed on itself regarding the issue of race. For most of the campaign, Davis functioned as McCain's silent partner. While journalists hounded McCain's senior campaign aides, people like Steve Schmidt, Mark Salter and Rick Davis (no relation), Fred Davis worked away in the shadows. Thousands of ballots are being challenged in an automatic recount that will determine the winner in Minnesota's Senate race. (CNN) – As the recount resumes this morning in Minnesota, the number of ballots being challenged is growing: Nearly three-quarters of all votes cast in the state’s Senate race have been recounted in the battle for Norm Coleman's seat. The recount, which kicked off last Wednesday, could extend into next month. Unofficial results from the November 4 election put Coleman, a freshman Republican senator, just 215 votes ahead of Democratic challenger Al Franken, known across the country from his days on Saturday Night Live and from his years as a talk show host on progressive radio network Air America. The slim margin for Coleman, far less than one-half of one percent, triggered an automatic recount, the first time there's ever been a recount of a U.S. Senate race in Minnesota. Election officials at 107 sites across Minnesota are in the middle of the long process of recounting all of the ballots, surrounded by election observers and lawyers from both campaigns, and the media. The Secretary of State's office reports that 2,801 ballots have been challenged so far, with 1,401 questioned by Franken's camp and 1400 questioned by Coleman's camp. According to the Secretary of State's office, 74.18 percent of the more than 2.9 million votes cast in the election were recounted through the weekend. Coleman's vote today is down 1,051 votes from his Election Day total, and Franken's is down 1,008 votes — which puts Coleman's current margin at just 172 votes. Recount sites across Minnesota have a deadline of the first week of December to report their results. After that, the state's canvassing board meets to rule on disputed ballots and to certify the election. If one side is unhappy with those results, legal action could follow. Democrats have so far picked up seven Senate seats in this year's election, with the Republican seats in Minnesota and Georgia still undecided. 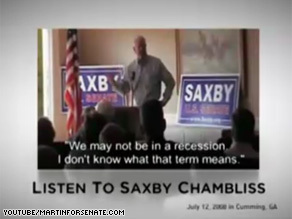 In Georgia, freshman Republican Senator Saxby Chambliss faces off in a runoff election on December 2 against Democrat Jim Martin, a former state lawmaker. If the Democrats take both remaining contests, they'll reach their pre-election goal of controlling 60 Senate seats, a filibuster-proof majority. A filibuster is a move by the minority party in the Senate that basically brings the chamber to a standstill by blocking votes on legislation. Rudy Giuliani will hit the campaign trail with Saxby Chambliss in Georgia on Tuesday. (CNN) - Add Rudy Giuliani to the list of big name surrogates who are making campaign cameos in the last remaining Senate election this year. The former New York Mayor and Republican presidential candidate teams up today with Saxby Chambliss at campaign events in Woodstock, Georgia. Chambliss is the freshman Republican senator from Georgia who is fighting to keep his seat. He faces a runoff election next Tuesday against Jim Martin, a former Georgia state lawmaker. Chambliss won a plurality of the vote on Election Day three weeks ago, but Georgia state law calls for the winner to grab 50 percent plus one vote. Due to the inclusion of a third-party candidate, Chambliss fell just shy of that threshold, forcing a runoff. Giuliani is the latest former GOP presidential candidate to stump with Chambliss. Sen. John McCain campaigned with Chambliss just nine days after losing the presidential election to Barack Obama. Nine days ago, former Arkansas Gov. Mike Huckabee, who ran for the Republican nomination before dropping out in March and backing McCain, campaigned with Chambliss. Former Massachusetts Gov. Mitt Romney teamed up with Chambliss on Friday. Romney ended his presidential bid in February and backed McCain. Giuliani dropped out of the Republican presidential race in late January and immediately endorsed McCain. 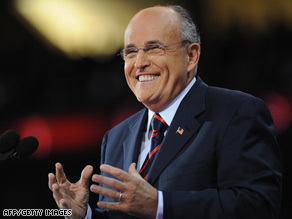 Giuliani, Huckabee and Romney could all make another stab at presidential politics in 2012. Martin is also getting some major-league help. Last week former President Bill Clinton campaigned with Martin in Atlanta and Sunday former Vice President Al Gore teamed up with Martin. Do these big name surrogates make a difference? "Generally they can help boost turnout, because of all the media attention. Turnout in a runoff election is often very low compared to a presidential election and each side needs to get as many of their voters to the polls as possible," says CNN Senior Political Analyst Bill Schneider. Democrats have so far picked up seven Senate seats in this year's election, with the Republican seats in Georgia and Minnesota still undecided. In Minnesota, freshman GOP Sen. Norm Coleman topped his Democratic challenger, Al Franken, by just 215 votes, triggering an automatic recount which will extend into December. If Democrats take both remaining contests, they'll reach their pre-election goal of controlling 60 Senate seats, which would be a filibuster-proof majority. A filibuster is a move by the minority party in the Senate that basically brings the chamber to a standstill by blocking votes on legislation. Robert Menendez will lead the organization that is charged with trying to get Democrats elected to the Senate. WASHINGTON (CNN) - Sen. Robert Menendez, D-New Jersey, was appointed Tuesday to head the Democratic Senatorial Campaign Committee, the political organization charged with helping to elect Democratic senators. Menendez succeeds Sen. Chuck Schumer, D-New York, as DSCC chair. Schumer held the post for four years and is credited with helping Democrats pick-up at least seven seats in November. Senate races in Georgia and Minnesota remain unresolved. In Georgia, a run-off will occur Dec. 2, while a recount is underway in Minnesota. Democrats currently hold 58 seats in the Senate, and victories in Georgia and Minnesota will give them 60 seats - a filibuster-proof majority in the chamber. Schumer is also credited with engineering a six seat gain in the 2006 midterm elections that gave the Democrats control of the Senate. Menendez joined the Senate in 2006 to fill the unexpired term of Sen. Jon Corzine, who resigned after winning election as New Jersey governor. 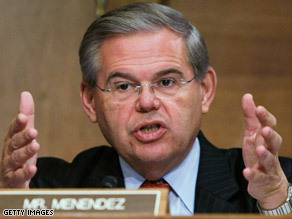 Menendez, who is Hispanic, won his own six-year term in the 2008 elections. For the past two years, the New Jersey senator served as the DSCC's vice chair. The DSCC in its news release stated that Menendez is the first Hispanic to chair a House or Senate campaign committee, and noted he became "the highest ranking Hispanic in Congressional history" when we was elected to lead the House Democratic Caucus before joining the Senate. Senate Republicans chose Sen. John Cornyn, R-Texas, to lead their political efforts in 2010 as chair of the National Republican Senatorial Committee shortly after the elections.